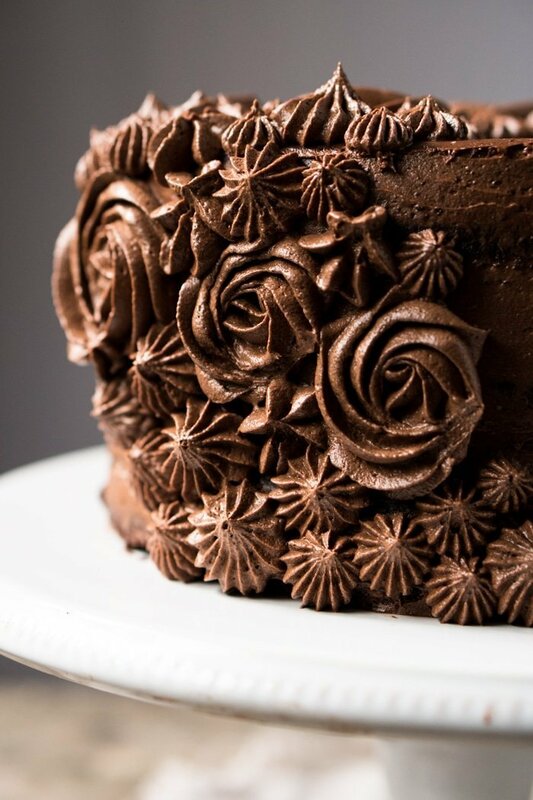 Intensely Chocolatey ‘N Ultra Moist! Think of this chocolate cake as first cousin to our suuuper fudgy keto brownies (easily the most popular recipe on the site). 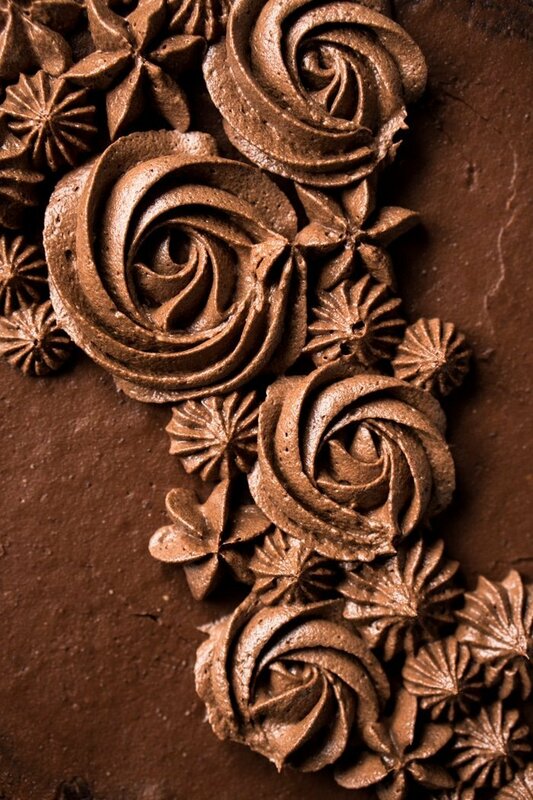 They both bloom the cocoa with melted butter, leading to that beautifully intense chocolate kick. 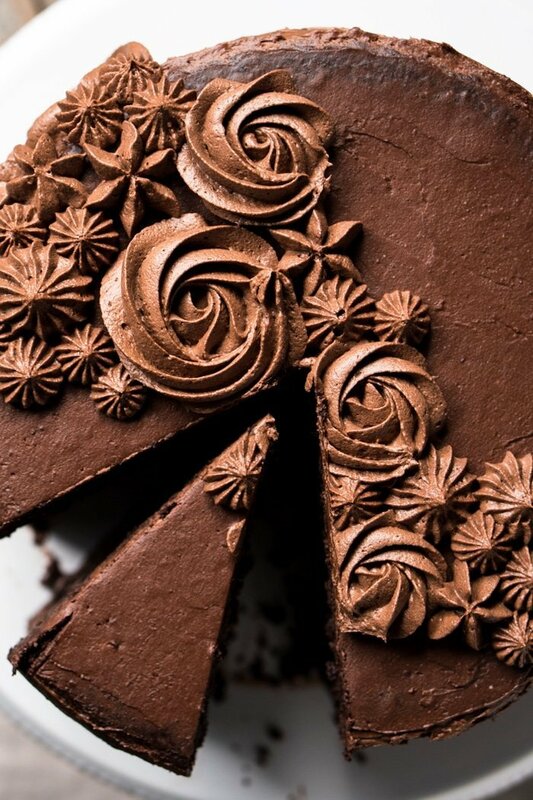 Did you also know that chocolate cakes around the world are often made with an almond flour base? Yup! 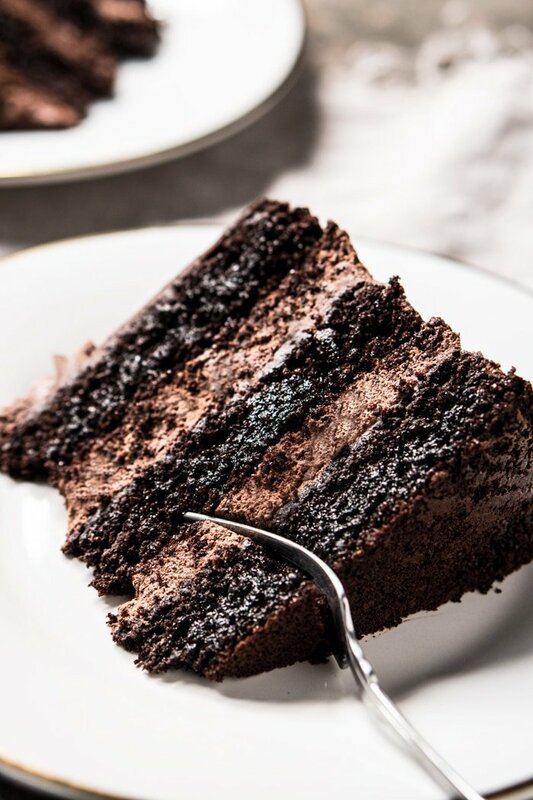 Think luxurious Italian chocolate cakes, where the almond meal is considered a prime pantry ingredient. So don’t think of this keto chocolate cake as second-best to the traditional wheat versions, but as a beautiful cake in it’s own right. It’s incredibly moist and with a tender crumb. And while the cake is ideal for layering, you can always whip up just one layer (or even as muffins!). p.s. this is also my chosen birthday cake year after year. It’s just so good and a true crowd pleaser! You guys will essentially be following our super easy brownie methodology (see video for reference). The ratios are a little different though, and there is some added flax for a more crumb-like texture. The most important thing though? The baking time! You’ll want to bake it until just set and a toothpick inserted comes out barely clean (roughly 15-18 mins). As any chocolate cake, baking too long will dry out the crumb. You’ve got options here. Think xylitol (no aftertaste and great texture), Lakanto (barely any aftertaste), and Swerve (some cooling sensation if you’re sensitive to it). Xylitol takes (much) longer to dry out though so your cake will be extra delicate right after baking, so just keep that in mind and allow it to cool in the pan for about 30 mins. If you’re opting for the cream cheese buttercream frosting, which comes highly recommended, your best option for no aftertaste is xylitol. But it must be powdered. So get your blender out, make sure it’s completely dry, and process your sweetener of choice until powdered. Just make sure you wait a few moments for the dust to settle before opening the blender or food processor. Or you can always grab a bag of powdered erythritol (Lakanto or Swerve). We like a mixture of super fine almond flour and golden flaxseed meal best. No xanthan gum is needed here to yield a wonderful and moist crumb (hurray!). Just keep in mind that for best texture and rise, you’ll always want to regrind your flaxseed meal in a dry blender or bullet. You’ll want to use a Dutch-processed alkaline cocoa here. 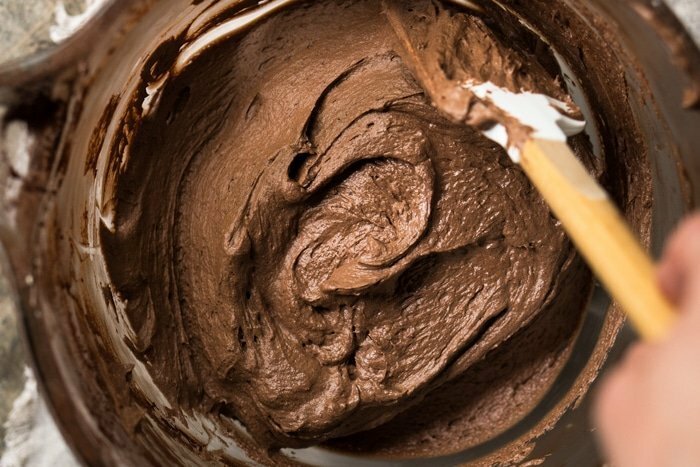 As there’s baking powder involved, using cacao won’t give the same results (at all!). In terms of brands, our favorite will forever be Valrhona, known to be one of (if not the) best cocoas in the world. 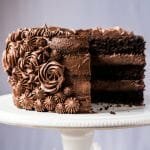 Incredibly moist and intensely chocolatey, this is the ultimate gluten free, paleo and keto chocolate cake. Layer it up with sugar-free buttercream frosting, or simply do it sheet pan style with ganache (or ice cream!). Each batch of cake is good for one 8-inch layer of cake. If you're building a two-layer cake adjust serving size to 12 and for three layers to 18. You guys will essentially be following our super easy brownie methodology (see video for reference). The ratios are a little different though, and there is some added flax for a more crumb-like texture. Position a rack in the lower third of your oven and preheat to 350°F/180°C. Grease, dust with cocoa powder, and line an 8-inch cake pan, set aside. Add almond flour, flaxseed meal and baking powder to a medium bowl. Whisk until thoroughly combined, set aside. Add butter (or coconut oil and cream), sweetener, cocoa powder, salt and espresso powder (optional) to a large heatproof bowl. Melt over a water bath whisking constantly (or use the microwave). You'll want to heat it up until most of the sweetener has melted and the mixture is well incorporated. Remove from heat and allow the mixture to cool slightly. Add one egg at a time, whisking well after each one until completely incorporated. The texture should appear smooth, with all the sweetener dissolving into the mixture. If you used coconut oil, you want to be sure to mix it particularly well. Add the flour mixture, whisking vigorously until fully blended (about a minute). Pour into prepared cake pan. Bake for 15-19 minutes, or until set and a toothpick inserted comes out just clean. Check often after minute 15 to ensure your cake doesn't dry out. UPDATE: A reader reported back on hers baking faster, so check in on minute 11-13 for doneness. And if you're baking cupcakes, you'll want to do 8-13 minutes (I do 8 to keep them fudgy, just note the center collapses a bit!). Allow to cool for at least 30 minutes in the cake pan, before transferring to a rack. It'll be particularly fragile right out of the oven if you made it with xylitol, so you need to let it set. If you're building a layer cake, you'll want to chill the layers (well wrapped) once they've come to room temp. 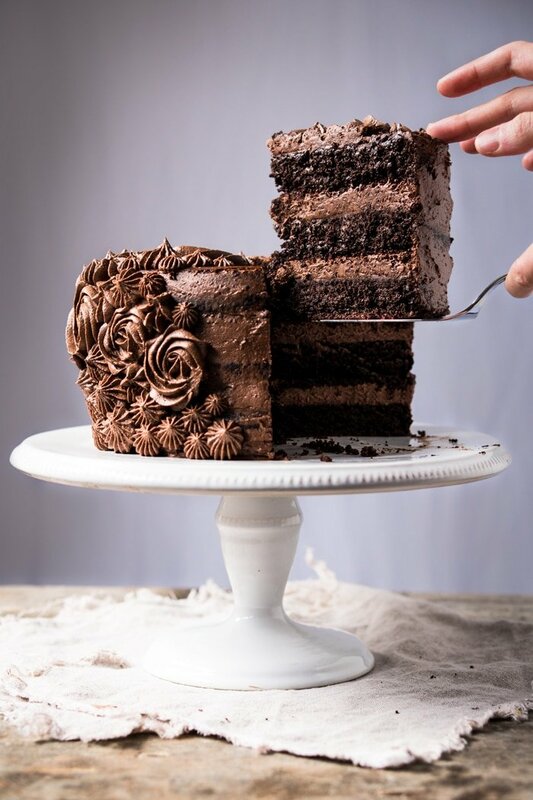 Because of this, I always bake the layers the day before, chill overnight, and make the frosting and layer up the cake the-day-of. 1 batch of frosting makes enough for a three-layer cake. Add the butter, cream cheese and sweetener to a large bowl. Cream the mixture with your stand mixer using the paddle attachment (or with an electric mixer) until light and fluffy, about 10 minutes. You'll want to scrape the bowl every so often to ensure an even mixture. Add cocoa powder to taste, espresso powder and salt and continue to beat until fully incorporated. Piping the frosting between the layers (no tip needed), ensures the most even distribution of frosting. And you could even do it with a ziplock bag! The cake keeps well, stored in an airtight container in the fridge, for about 3 days. And it also freezes beautifully, just thaw it out in the fridge overnight. *Please see section on sweeteners for deets and possible substitutions. Just keep in mind that stevia doesn't work (at all!) for these! ***Must use eggs at room temp. Reason being that if you add cold eggs, you'll solidify the batter and won't be able to mix the flours properly. Please note that nutrition facts were calculated per slice (1/6th of a layer), which is the equivalent of 1 muffin. If using psyllium husk as alternative to flaxseed meal, is it same measurement? Could I use the batter for cupcakes? I have relatively low spoons (low energy) and find cupcakes much easier to make then layering a cake. Can I use Swerve confectioner’s and Swerve granulated sweetener instead of xylitol? I have animals in my house so don’t keep xylitol here. Yeah definitely Victoria! Your batter will likely end up thicker, but don’t worry it doesn’t affect the final result (just keep in mind the slight cooling effect) xo! What if I don’t have the type of cocoa you are suggesting just the regular cocoa powder is there a way to make this using that, would I need to add xanthan gum or is it only doable with that type of cocoa? Hi Catherine! It’s not about the brand or adding xanthan gum, it’s about the reaction with the leavening agent. You just want to be sure to use an alkalized cocoa xo! So would this explain why mine came out flat? I used regular cocoa as well. Couldn’t we just add a touch of baking soda with cacao? I don’t have any cocoa either. I see many videos with this recipe for everything but this cake. Is there any video that was made particularly for this cake and how would I access it? 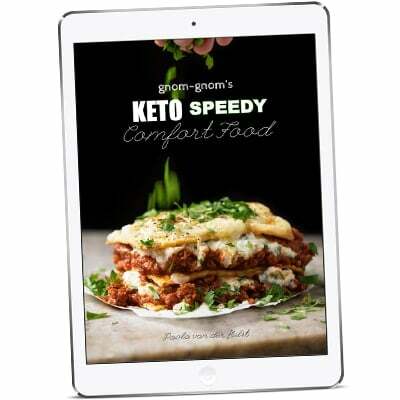 Hi is there a other to use golden flaxseed meal instead? And how much? You say the xylitol must be powdered for the icing. For the actual cake, should it be powdered as well? Or granular? Also, is the icing recipe enough for just ONE round 8 in cake, vs a layered one? And finally, why do you add the flaxmeal? Thank you for this post. I only had stevia based sweetener, however, I made veriations on this recipe without chocolate. The crumb is amazing. I made a coffee, lemon ginger, and red velvet cakes with the base recipe and they were fantastic! Hi Rose, what variations have you made? I’m very interested in have a base cake recipe! Can you please share how you used the stevia based sweetener and made this successfully? HOLY GUACAMOLE, this cake is legit!! I just made this for my friend’s birthday, as she is very strictly keto per the doctor’s guidance, and it was a HIT! 😀 Best cake ever, and everyone at the party had it, despite there being a second regular cake! Will be making this for all birthdays (including my own coming up in a few days haha!). Thank you so so much for this recipe! I did two layers, but definitely doing three next time! I also used an avocado mousse as the frosting and WOW! Thank you, thank you! Super awesome to hear Britt! And I totally get you- this is my bday cake year after year 😉 xo!! ps. happy early bday! Can you share a link of the avocado mousse? I’m looking forward to making this cake tomorrow for my boyfriends birthday. I’m a little confused with the Cocoa. I have a Hershey’s brand that says “Hershey’s Cocoa” but right underneath it says 100% Cacao. The ingredients read: “Cocoa: Cocoa Processed with Alkali”. Also was considering making a Carmel sauce to add..let me know if you have any recipes. Does the nutrition information include the frosting? I made this today for first time for my husbands birthday and didn’t want to kick us out of ketosis. It was wonderful but didn’t come out of the pan well and ended up breaking and coming out in pieces. Very sad! Did all directions exactly and used xylitol as sweetener. Did a double recipe for two 9inch pans and would change to a smaller plan in the future. How do you suggest I do it next time to ensure it coming out of the pan easier? I saw it said grease, dust with cocoa but didn’t know what line the pan meant. Maybe that was the problem. Hi Renee! I’m sorry it crumbled on you! 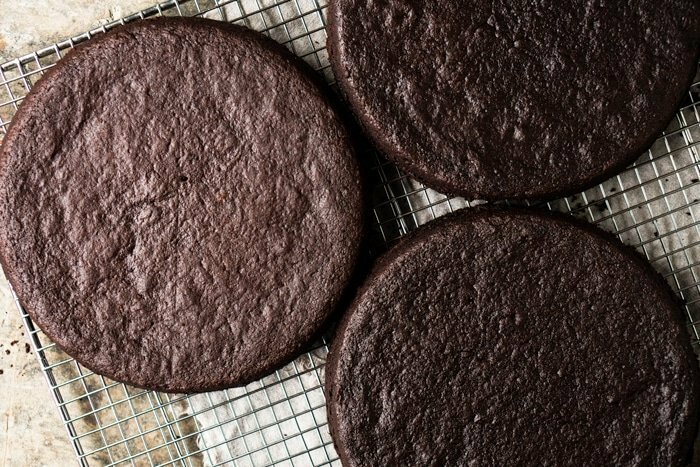 In baking terms, lining the pan means cutting out (or purchasing) a circular piece of parchment to line the base of your cake pan to ensure the layers come out in one piece. I made a double batch for a 2 layer cake. And they didnt rise at all. The dough wasn’t pourable either. Just wondering what I could have done wrong?? What sweetener did you use Jenn? I’ve found that some erythritol based sweeteners can make the batter seize up? Any other changes? I used erythritol. Instead of flaxseed meal(didnt have any) I used the amount of it in additional almond flour.and instant Decaf coffee instead of espresso. If I use Erythritol, should I use less? Hi! Isn’t there another kind of sugar substitute I can use instead of xylitol for a Keto diet? 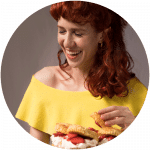 Erythritol is a second option, see the section on sweeteners xo! I’m thinking about using monk fruit, what do you think? Just keep in mind it’s not keto (don’t know what diet you follow!) xo! Wow. Easily my favorite Keto dessert I’ve ever made. For those of you debating whether or not to put the extra work in to make a 3 layer cake rather than 1, DO IT! I will make this cake for my families birthdays for the rest of our lives, and they won’t complain about it either! I didn’t have any flaxseed, so I tried tapioca flour instead. It turned out very well, can’t wait to make it again. Hi! I love your recipes and can’t wait for this one! My birthday is on Tuesday and I’m wanting to make a 2-later 9 inch cake. How much do you think the baking time would differ? That’s super awesome to hear Hailee! I would probably triple the recipe and divide the batter between the two 9-inch pans. Baking time in all honesty can vary a lot from oven to oven with this cake, but for instance in my oven it would likely be 5-8 mins more xo and happy birthday!! This looks heavenly and I am dying to try it .one question,can I use mascarpone cheese instead of cream cheese. Definitely Sweta! The taste will change as mascarpone is a bit less tangy, but still delicious xo! Please someone help me…. How much of this do I need to make for a 12×18 cake pan?? For a birthday crowd. Thanks! 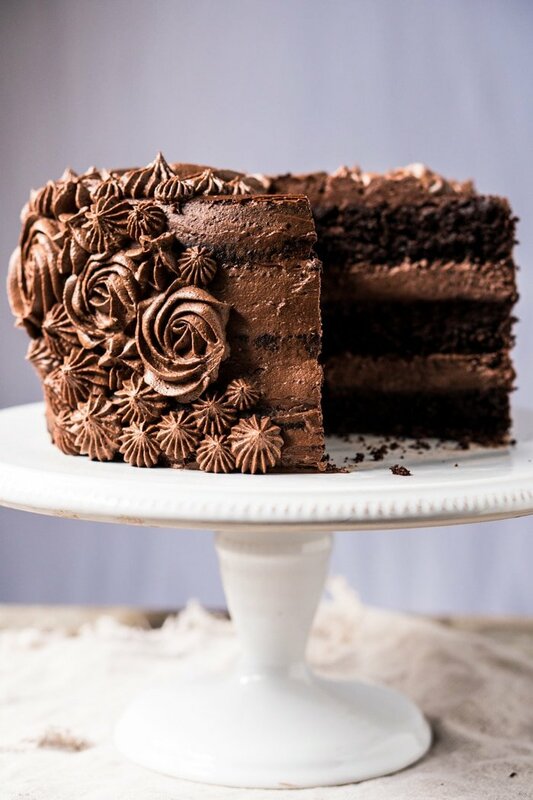 I need to bake this for a crowd, using a 12″x18″ cake pan. Can you tell me how many servings I need to adjust this to for it to be enough for that size of pan? Thank you. Do the nutrition facts shown include the frosting for the single layer, or is it just the cake? Just the cake, and do keep in mind that the more layers you add the more slices you get. xo! So if I did a 3 layer cake, would a 6th of a cake equate to 3 slices worth on the nutritional side? I’ve gotta stay under 20g of carbs! Looking forward to trying this for my son’s birthday cake. I plan to cover it with modelling chocolate. Do you think I should add some tapioca to the cake mix perhaps (not concerned if non keto) to make it not so fudgey ? Definitely! You can prob sub 2TBS of the flax and 3-4TBS of the almond flour, but because I haven’t tried it myself I would suggest doing a test batch as it’s for a special occasion 😉 happy birthday to the little (or big?!) guy! I only have 9 inch cake pans. Do I bake it for less time? My son requested this cake for his 21st bday. I made cupcakes which turned oit beautifil. The whole family has converted to keto here and we love it. Visiting relatives who eat sugar daily tried these and said thesee were really good. I feel I should have cooked a little less as you suggested because I think they were a bit dry. Otherwise everything else about this recipe tastes perfect. I made the cinnamon rolls 3 days ago. They were so good, only lasted 2 days! Love your recipes thank you for your creativity. Hi! Thanks for the recipe! I made this cake tonight and it was really delicious (I have to admit I was terrified to taste it even though the reviews were amazing). It tastes just like brownies, it was very dense and gooey. Question though, the numbers displayed in the recipe, does that include the cake and frosting? Or are the numbers just for the bare cake? When I say numbers I am talking about the nutrition chart. Cacao and cocoa are different ingredients (cacao is raw, cocoa is alkaline). You want to make sure you use a cocoa here (if your Hershey’s says cocoa you’re fine, if it says cacao it’s a no). xo! I did not know the difference between CACAO and COCOA, interesting. Every day you learn something. My question is regarding Almond flour. I usually prepare it at home, can I use mine or should I buy the one that is already industrialized? Hi!! I made this cake today! The frosting tastes amazing! We havent had the cake yet,but Im so excited! My layers came out really thin–I did use a 9 inch cake pan but it looks like it didnt rise at all…Im not sure why. Was the xylitol for the cake supposed to be powdered or just as it comes in the bag? When I put everything in the hot bath the batter was kind of thick. I didnt need to pour it, but instead I had to spoon it into cake pans. lol! Also, wheb the recipe says 1-1.5 cups of xylitol is that for the level of sweetness that I want?What do you use? Let me know your thoughts! 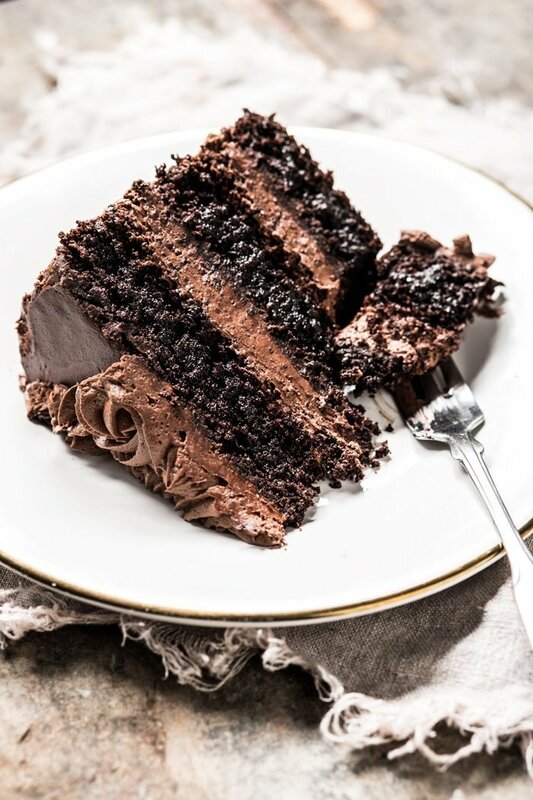 I’ve recently made this cake and I can’t believe how good it tastes and that it tastes as good as a usual chocolate cake if you know what I mean…the only thing is I gave my sister a piece and it kicked her out of ketosis…any reason why? Hi Maz! Awesome you guys enjoyed it so much, but oh no on the ketosis issue! I don’t see how that could happen with the ingredients in the cake… but what sweetener did you guys use? Could it be that overall in that one meal too many carbs were consumed all at once? For instance, I do carb ups 1-4 times a week. But sometimes my carb-ups are simply more of higher carb keto foods? I’m fat adapted by now, so I’ll be out of ketosis for a few hours and back in by evening/next morning. I hope this helped, otherwise be sure that your sweetener is a pure sugar alcohol (no hidden maltodextrin etc). xo! I am trying to make this cake for the first time and used the microwave method first to melt the butter and incorporate the sweetener. It didn’t seem to work to melt the xylitol so I then switched to water bath and I now have a ball of sticky solids that will NOT incorporate at all into the melted butter! Help!!! I absolutely love baking and honestly all keto cakes recipes I tried before were crap. This is an amazing chocolate cake independent of being keto or not!!! I may try to make a vanilla version of it. Just one question about the nutritional info. Does it include the frosting? I have a lot to lose so I’m watching my macros closely.